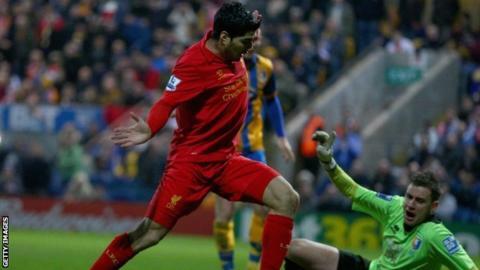 Luis Suarez's hotly-contested goal ensured Liverpool avoided an FA Cup third-round shock as battling Blue Square Bet Premier side Mansfield Town were beaten at Field Mill. Suarez emerged as a substitute after the break to again become the central character in controversy, as a clear handball preceded his scoring of Liverpool's crucial second goal. Daniel Sturridge announced his arrival as a Liverpool player with an early debut goal following his move from Chelsea as Brendan Rodgers's team dominated the first half. Mansfield, however, were subjecting Liverpool to a sustained assault in a second-half spell that persuaded Rodgers to introduce Suarez - and the Uruguayan obliged with the all-important goal, but with a helping hand that left the Stags and their fervent fans infuriated. Referee Andre Marriner and his officials saw no offence and it left Mansfield with too much to do, despite Matt Green setting up a frantic closing phase by pulling a goal back 11 minutes from time. Reds boss Rodgers will be delighted to have survived a hazardous assignment to set up a fourth-round visit to Oldham Athletic. The pre-match build-up inevitably focused on the prospect of Mansfield claiming a Premier League scalp - but Liverpool wasted no time in reminding their hosts of the reality of that task. Liverpool gave an immediate debut to Sturridge and left Suarez on the bench, and the former Chelsea man punctured the optimism around Field Mill within seven minutes, applying a composed finish to Jonjo Shelvey's precise pass. "If you go to the Uruguayan looking for the romance of the cup you have come to the wrong place. He does not do romance when it comes to football and this was no different"
The same pair combined to cut Mansfield open once more but this time the striker took his time and allowed Stags' keeper Alan Marriott to make a one-handed save. Mansfield's main danger in the opening 45 minutes was the colossal throws of defender Exodus Geohaghon. He had several opportunities in the first half but Liverpool dealt well with the threat. The non-league side were not short on endeavour but Liverpool's pace and quality, understandably, was often simply too much for Mansfield to cope with. Stewart Downing saw a powerful drive blocked as he drove into the area, while Shelvey was a prominent figure. While Mansfield remained only one goal in arrears there was always hope - and their spirits were lifted when Green's powerful shot drew a smart save from Liverpool keeper Brad Jones. Sturridge was enjoying the space and service afforded to him in his first Liverpool appearance and he forced Marriott into another fine fingertip save with an angled effort. The Stags gave Liverpool anxious moments early in the second half as Anthony Howell and Louis Briscoe brought blocks from Jones, the signal for a busy second half for the Australian. As Mansfield grew in confidence, the visitors were placed under heavy pressure and Jones saved once more from Briscoe. Liverpool then survived an almighty scramble as Jones clawed away an effort from John Dempster who touched on Geohaghon's header. Rodgers wasted no time in responding, removing Sturridge and Suso for Suarez and Jordan Henderson. The introduction of the Uruguayan worked as Rodgers intended, the striker putting a stop to Mansfield's revival, but only after the ball clearly struck his hand before he put the ball away. Once Mansfield's heads had cleared from Suarez's controversial goal, they came again and Green established the platform for a grandstand finish, in which he tested Jones once more, but Liverpool survived.